Comments: The black vulture has very similar habits to the turkey vulture. They sometimes share the same roosts, and like turkey vultures, are often seen with wings outstretched to absorb the heat of the sun. They are distinguished from turkey vultures by their shorter tail and their short, broad wings with white wing tips. Adult birds have a dark gray to black head. 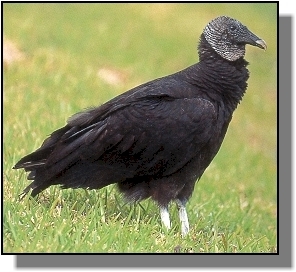 Distribution: The black vulture is a vagrant but occurs occasionally in southeastern Kansas. It is common from southeastern United States through most of South America. Food: Vultures are scavengers. They eat carrion even if it is badly decomposed.